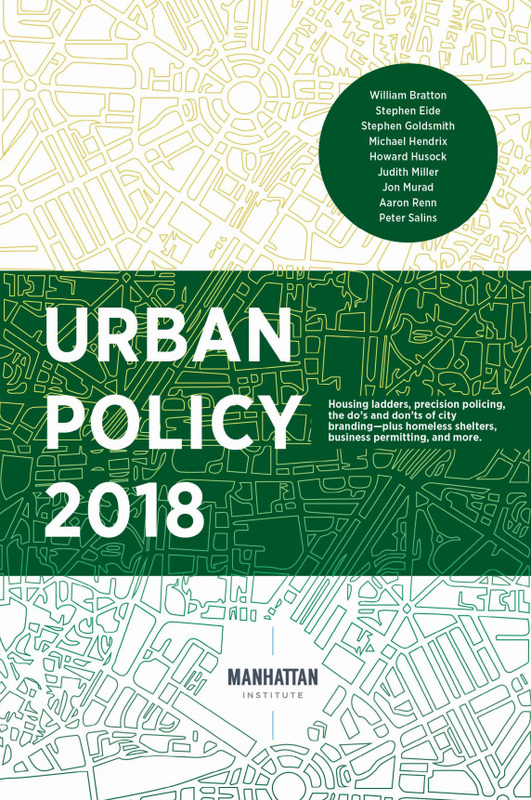 Editor's note: The following is the seventh chapter of Urban Policy 2018 published by the Manhattan Institute. 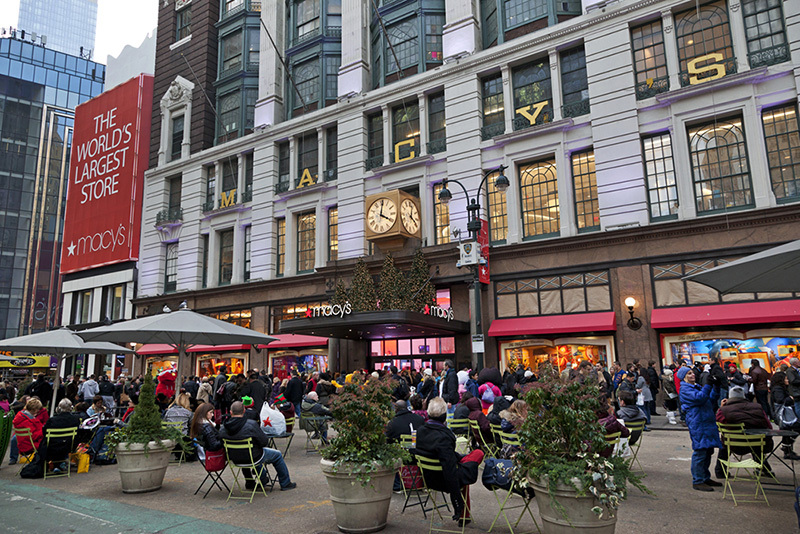 Homelessness remains a problem in many U.S cities, no more so than in New York City. New York spends more than $2 billion a year to provide temporary housing to 14,500 homeless single adults and 15,200 families, about 60,000 people in all (with thousands more living on the streets and in the subway system). And that does not count the hundreds of millions of dollars the city also spends on prevention efforts aimed at reducing the number entering shelters and rental-subsidy programs to facilitate their exit. Nonetheless, the “crisis,” as it is referred to by numerous observers and the city itself, shows little sign of abating. During his tenure as mayor, Bill de Blasio has twice put forth plans to reform the delivery of homeless services. Improving shelters—making them safer and cleaner—has been his administration’s top priority. But the administration has paid much less attention to the ability of shelter operators to move homeless adults and families out of their facilities and back into the community. To do so, New York City—as well as other large American municipalities—should draw on a system pioneered by de Blasio’s predecessor, Michael Bloomberg (mayor from 2002–2013). Beginning in 2003, New York City set up a system of performance benchmarking and financial incentives known as the Performance Incentive Program (PIP). In the program, shelter operators had their performance quantitatively evaluated and published in regularly issued public reports, ranking them against peers that serve similar populations. The performance was mainly determined based on the rate at which shelter operators placed adult- and family-shelter clients back into independent housing in the community, their average length of stay, and the rate at which formerly homeless people returned to shelters. High performers received bonuses, and low performers faced a serious threat of loss of their contracts. The Bloomberg administration viewed PIP as essential to its efforts in reducing the number of people living in shelters and their length of stay—and there is evidence to suggest that PIP did just that. Almost every instance in which the city has managed to reduce the shelter census or average length of stay on an annual basis has occurred when PIP was active. After assuming office in January 2014, however, Mayor de Blasio let PIP lapse. New York City’s shelter system developed in response to the emergence of the “modern” homelessness problem in the late 1970s. Prior to that time, the homeless population consisted mainly of indigent single men suffering from high rates of alcoholism.1 Today, most homeless New Yorkers are members of families, most of which are headed by single mothers (Figure 1).2 The homeless population now faces substance-abuse disorders other than alcoholism, as well as a high rate of serious mental illness. New York’s response to modern homelessness evolved over four decades by five mayoral administrations. Two landmark events stand out. 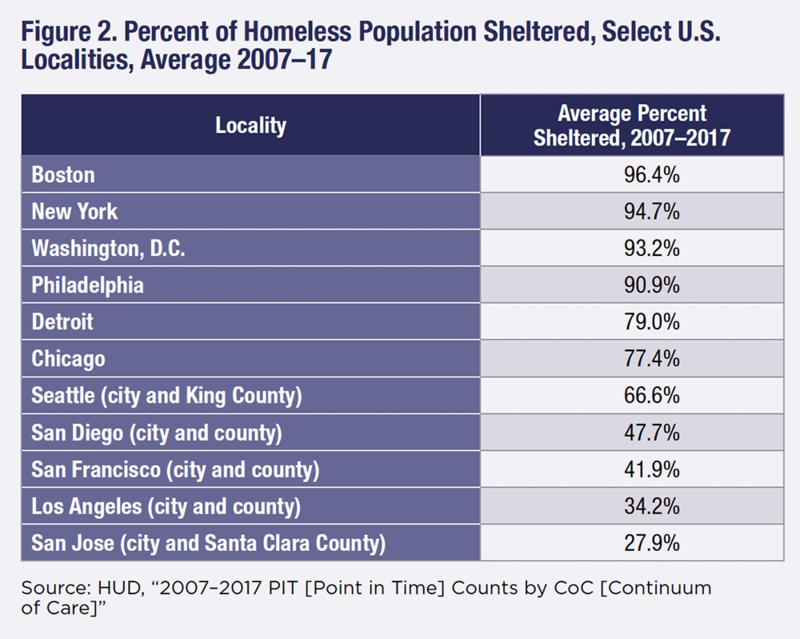 The legal right to shelter may have reduced the percentage of unsheltered or street homelessness in New York City, though its effect is difficult to disentangle from other factors, such as New York’s long tradition of generosity in social-services spending and its harsh winter climate.5 Other cities that do not have a right to shelter (Philadelphia), or a much more qualified one (Boston and Washington, D.C.), have nearly the same rate of sheltered homeless (Figure 2). Counting unsheltered homeless is far from a precise science, so a difference of a few percentage points may not be consequential. Homelessness in New York City has been termed a “crisis” by the administration, advocates, politicians of both parties, and various media organizations.14 As of late 2017, there were about 14,500 single adults and 15,200 families living in the DHS shelter system. 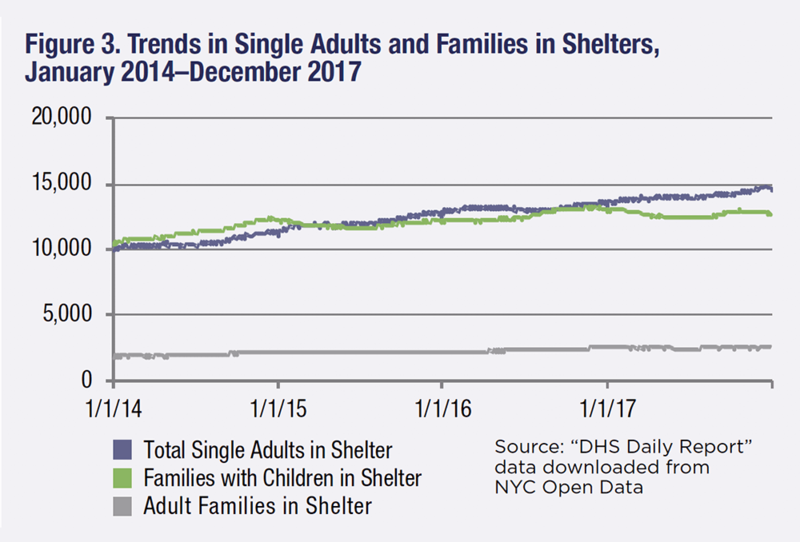 Throughout de Blasio’s first term (January 2014 to December 2017), the number of families in shelters increased by 2,879, or 23%, while the number of single adults increased 4,657, or 47% (Figure 3). In raw numbers, 50,954 adults and children were in shelters on January 1, 2014, and 59,933 on December 31, 2017. 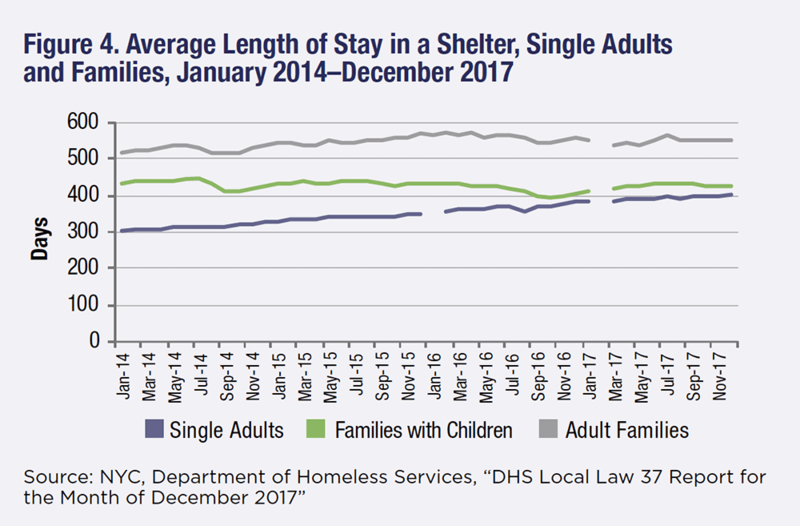 Single adults are staying in a shelter about 100 days longer than they were, on average, in January 2014; and 37 days in the case of adult families (couples without children).15 The average length of stay for families with children is now about six days shorter than it was in January 2014 (Figure 4). State regulations require that many services be provided to shelter clients. In testimony given late in 2016, city officials noted 70 shelters (47 for single adults, 23 for families with children) that provide onsite health care, with other facilities referring clients who need medical services to nearby providers offsite with whom the provider has a “linkage agreement”; additionally, “many shelters have art therapists, occupational therapists and recreational activities such as outings, yoga and health classes.”19 On the single-adult side, they noted 27 “special program” mental-health shelters and nine substance-use-disorder shelters.20 Traditional, or “Tier II” family shelters (distinct from cluster sites and hotels), are required to provide child care (though a recent report by the city comptroller found that not all providers were in compliance).21 All shelters are required to provide three nutritious meals a day. The right to shelter is balanced by “Client Responsibility” rules that were first proposed under Mayor Giuliani—fought against for seven years by the Legal Aid Society—and implemented during Mayor Michael Bloomberg’s first term.22 The rules remain in place today. Each month, DHS denies more than 1,000 petitions for family shelter. 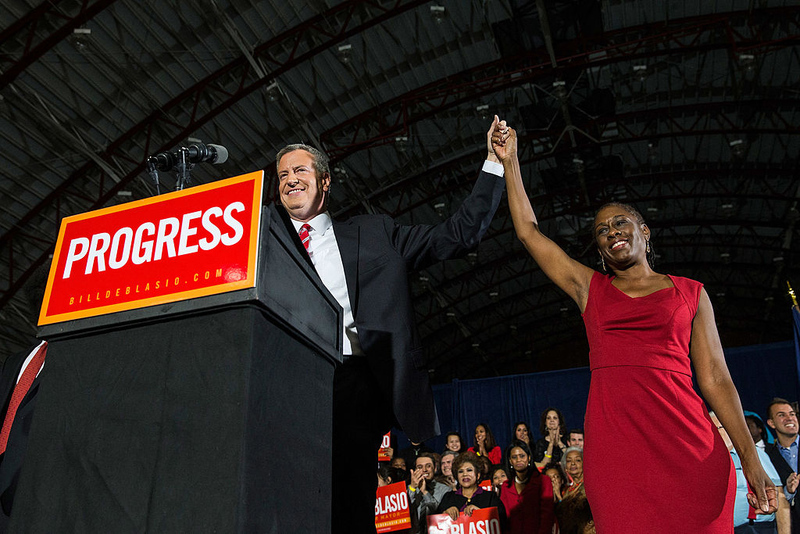 In his 2013 mayoral campaign, de Blasio criticized existing city shelter policy for its “unfair and overly punitive eligibility review rules that deny shelter to too many needy families.” Accordingly, in late 2015, the de Blasio administration sought greater leeway to grant shelter access from the state Office of Temporary and Disability Assistance (OTDA), which regulates city shelter services. 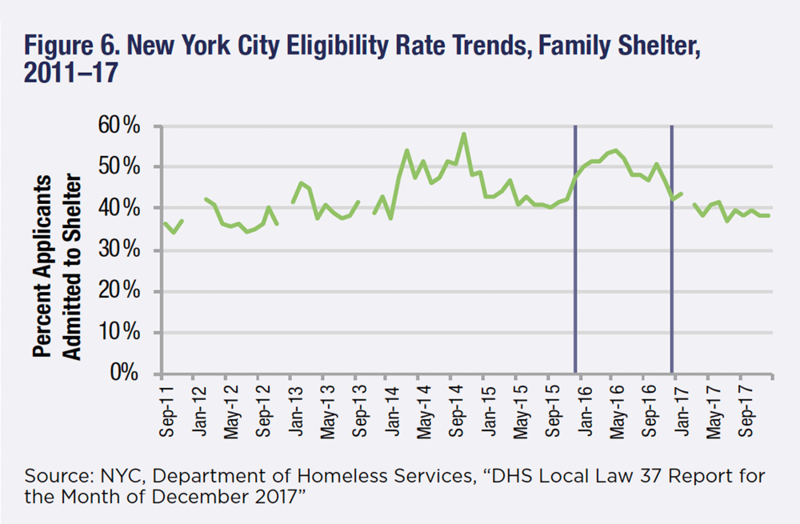 However, one year later, after the eligibility rate had risen, the de Blasio administration asked the state to restore the previous authority of DHS to explore the possibility of keeping shelter applicants housed in an apartment leased to a family member or friend.33 Advocates opposed this move,34 which has brought eligibility rates closer to historical levels (Figure 6). In New York, shelter services have always meant more than just providing a clean, safe place to stay. In the most recent “Mayor’s Management Report,” DHS stipulates that one of its overarching goals is to “help individuals and families transition to permanent housing and self-sufficiency.”54 This entails that the agency not only ensure that “all temporary shelters for homeless individuals and families are clean, safe, and well-run” but also that it “[f]acilitate exits and minimize clients’ length of stay in shelters.”55 Shelter outcomes—as opposed to shelter conditions—concern how effective providers are at moving clients toward an independent living situation in the community as quickly as possible. The virtue of the not-for-profitization shelter system is not so much that private organizations would be better than the city at providing a clean safe place to stay; instead, the theory was that these organizations would be more effective at establishing self-sufficiency. Improving shelter outcomes and enhancing shelter conditions are two different tasks that sometimes are in tension with each other. The more comfortable an adult or a family feels in a temporary housing situation, the weaker the motivation could become to move back into the community. At a time when shelter conditions are said to be generally improving, like the present, it becomes all the more incumbent on shelter operators to work to place their clients in stable, independent housing. Under Mayor de Blasio, however, the issue of shelter outcomes has been eclipsed by that of shelter conditions. The administration could have a policy rationale for ordering DHS’s priorities in this manner, or it could simply be responding to pressure from the many negative reports about shelter conditions and safety. Whatever the reason for de Blasio’s priorities, shelter outcomes received far more attention under his predecessor. In 2003, the Bloomberg administration launched the Performance Incentive Program (PIP), a system of benchmarking and financial incentives for shelter providers. Building on earlier efforts by the Giuliani administration,56 PIP measured providers’ rate of housing placements, clients’ length of stay, and the rate of return to shelter. The city set basic placement targets to ensure at least a minimum number of move-outs per year. Points were also awarded for “process”-type shelter functions, such as ensuring that clients were signed up for appropriate benefit programs and that their housing applications had been filed in a timely manner.57 Each shelter’s successes were tallied up to a final score. 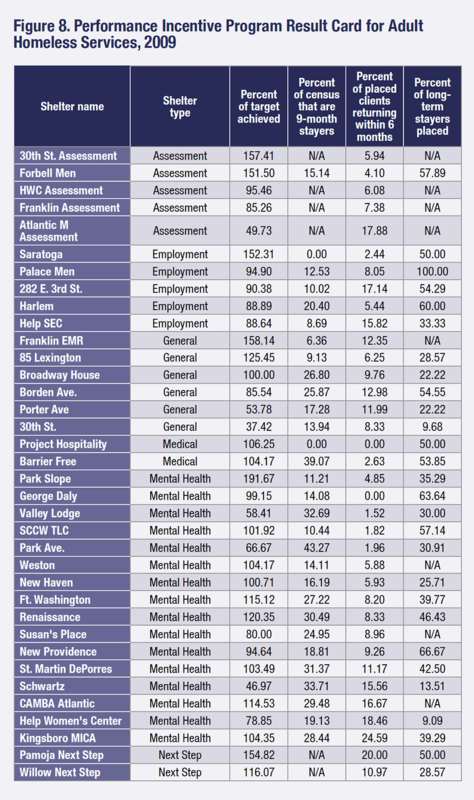 Shelter scores were published in quarterly rankings, where providers (and the city) could compare their own facilities against other providers that dealt with similar populations, as well as in an individualized report card. Providers were given financial rewards for performance and risked a loss of funding for failing to achieve their benchmarks.58 The financial incentives ranged around 10% of the facility’s base budget. 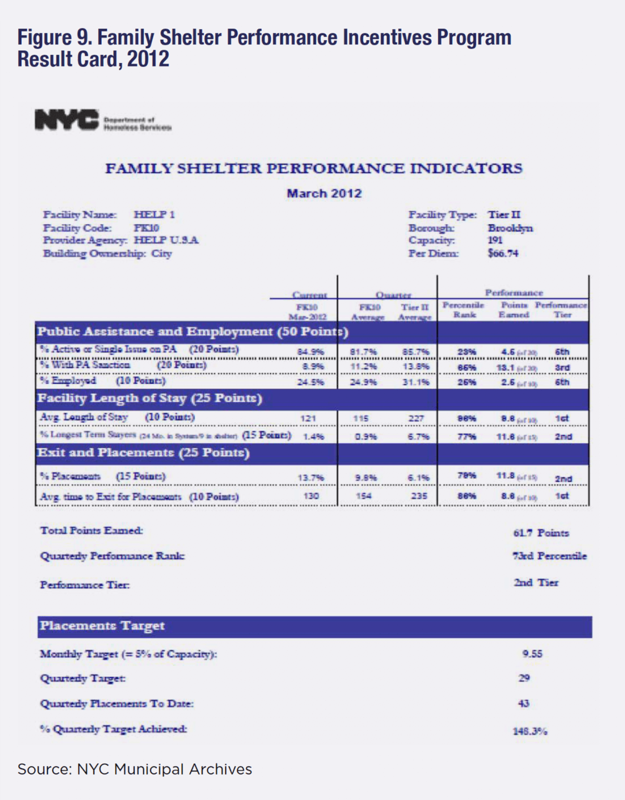 Figures 8 and 9, respectively, show examples of how Bloomberg’s PIP rated shelters: a systemwide “results card” for single adults from 2009; and a report card for an individual family shelter provider from 2011. Figure 8 shows that providers working with similar populations, the same housing market, and the same array of rental-subsidy programs placed at their disposal by the city met with varying results. Of the seven substance-abuse shelters, some experienced a 2% “recidivism” rate, i.e., a return to shelter within six months, whereas others’ rates were as high as 24%. Of the mental-health-shelter providers—which deal with some of the most challenging cases in the entire shelter system—most (11) experienced a recidivism rate of less than 10%. And for the cohort of 49 as a whole, 34 adult shelters in calendar 2009 met at least 90% of the target set by the city (indicating that standards in this particular year were not unrealistic), though some hit less than 50% of the target. 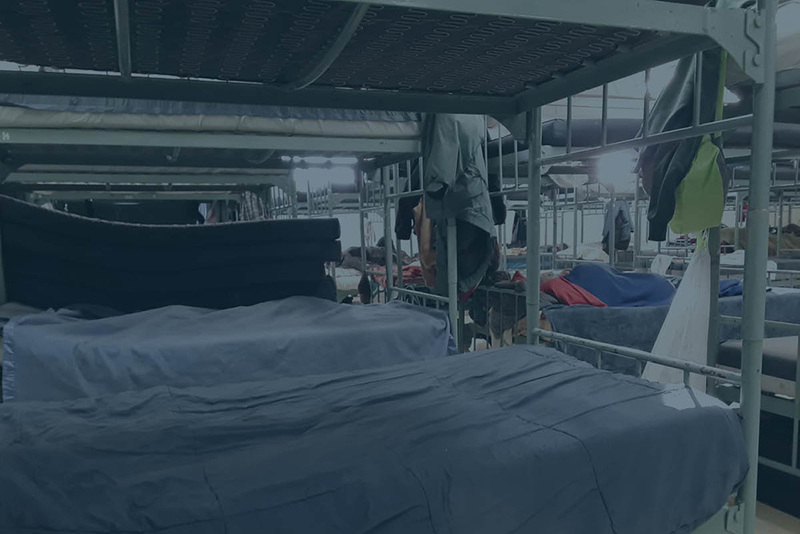 An “assessment” shelter is where clients go after intake while it is being determined which shelter placement would best suit their needs; “next step” shelters were started by the Bloomberg administration. They provide intensive case management to long-term stayers. One year’s results should be kept in context: some shelters serve a small population, and their outcome data could be influenced, for instance, by a handful of difficult cases. But these results are striking and prompt important questions as to why some providers may be surpassing others in rates of placement and return to shelter. The Bloomberg administration saw PIP as one part of a general approach to homelessness that included not only prevention and rental subsidies but specific obligations placed on clients as well as shelter providers to work toward the goal of self-sufficiency. From FY 2005 to FY 2010, the average length of stay for single adults declined every year. In 18 other instances, under Bloomberg, the average length of stay or average daily count declined for families or adults (Figure 10; years of decline have been shaded). Bloomberg cited PIP as one factor in these successes.59 His administration’s successes in keeping down the shelter census were, of course, only temporary; other factors, such as conditions in the low-rent housing market, would have to be explored. Moreover, any comparison between the two mayors’ administrations has to consider that Bloomberg completed three terms in office, compared with de Blasio’s one. But it can be said that, since 2003, most instances in which the city managed to reduce the census or length of stay have occurred when PIP was active. The de Blasio administration has shut down providers for instances of egregious abuse.63 But scrutiny should also be applied to shelters that, though not abusing their clients, are not doing enough to move them along to self-sufficiency. The city is not doing enough to distinguish between poor-, mediocre-, and high-performing providers. As the de Blasio administration is embarking on its expansion of the shelter system and projecting high levels of homeless for years to come, this is an oversight that should be corrected promptly. The way to do so is to relaunch the performance benchmarking program, both for family- and single-adult shelter providers. Providers with similar populations should be compared, in publicly available reports posted at least annually, in terms of their average length of stay, move-out rates, and rates of return to shelter. All such move-out metrics should constitute 75% of whatever score is given providers. Shelter is an intervention that should be as brief and effective as possible. As with jails, mental hospitals, and foster care, there is a great risk that staying in a homeless shelter is preparing someone to be homeless, instead of for a life of independence. The public reports should provide more than rankings or tallies of final scores. They should indicate, in figures and language understandable to those outside the social-services world, exactly how well each of the city’s hundreds of shelter providers is succeeding at keeping its clients from staying too long and minimizing the rate of return after they’ve left. What we measure depends on what we believe we want shelters to do. Some providers do important work in the area of employment services. And so long as there are thousands of seriously mentally ill people in the shelter system, mental-health services will be necessary, and we should be interested in which shelters do better work than others in this area. 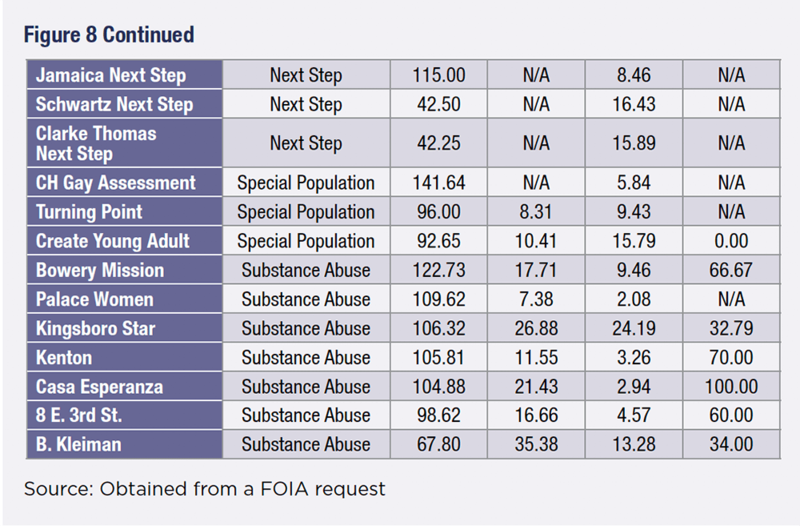 In the case of such special program shelters, success in mental health, substance-abuse treatment, and employment programs’ outcomes could also be tracked. But none of those metrics should outweigh the average length of stay, rate of placements, and rates of return. The public transparency aspect of performance benchmarking suffers when the metrics become overly individualized and complicated. Test scores, for example, are not the only way to evaluate whether a school is good, but they are an essential starting point. Concerns about overemphasis on short-term placements out of shelter can be met by monitoring rates of return: the goal is stable housing in the community, not “churn” from shelter to the community and then back to shelter. Special program shelters that excel at employment and treatment efforts are very likely to also experience low rates of return. (DHS has tracked system-wide rates of return for many years.) Providers should be free to continue to raise private funds to enhance their service offerings. But in terms of their core, government-funded mission, the emphasis should remain on sustainable move-outs. In addition to benchmarking, the city administration should institute financial incentives. High performers should be rewarded with a financial bonus valued at 5%–10% of their base shelter contract. The ideal solution for low performers would be to put them on watch and then, in the absence of improvement, transfer their work to a higher-performing provider with the capacity to take on the additional client load. The low-performing facility could remain in place and be taken over by another organization (i.e., changing shelter operators would not entail a controversy over where to site a new facility). Banks’s confidence in the administration’s ability to make headway with the crisis is backed up, in a sense, by data that show that only 7.5% of the city’s homeless population (5,755) is classified by the U.S. Department of Housing and Urban Development as “chronic”—meaning an individual or a head of household who suffers from a disability or diagnosable disorder and has been homeless for a year or four times in the preceding three years.66 This rate is less than half the rate of the chronic homeless population for the nation as a whole (Figure 1). In FY 2017, more than 17,000 single adults and family units exited shelter, about 7,800 of which did so without the assistance of any subsidy program.67 While the low-rent rental market remains tight and shelter recidivism remains a concern, it appears that independent living in the community remains in reach for most shelter clients. An earlier version of this paper was published by the Manhattan Institute in March 2018. Michael D. Zettler, The Bowery (New York: Drake Publishers, 1975). Thomas J. Main, Homelessness in New York City: Policymaking from Koch to de Blasio (New York: New York University Press, 2017), ch. 1; Joel Blau, The Visible Poor: Homelessness in the United States (New York: Oxford University Press, 1992), ch. 7; NYC, Office of the Mayor, “Mayor Bloomberg Announces Settlement with the Legal Aid Society Ending 25-Year Litigation and Court Oversight of Homeless Family Services System,” Sept. 17, 2008. See Peter Hellman, “Justice Freedman v. New York,” City Journal, Spring 1997; Susan Rosegrant, “Linda Gibbs and the Department of Homeless Services: Overhauling New York City’s Approach to Shelter,” C16-07-1873.0, Kennedy School of Government Case Program 2007; Main, Homelessness in New York City. New York City Council, Committee on General Welfare, “Brieifng [sic] Paper of the Human Services Divisions, Oversight: An Examination of the Department of Homeless Services 90-Day Review,” Apr. 21, 2017; Main, Homelessness in New York City; New York City Commission on the Homeless, “The Way Home: A New Direction in Social Policy,” February 1992. The commission was named for its chairman, Andrew Cuomo, who is now the governor of New York. “The Way Home,” p. 116. Office of the New York City Comptroller, “Checkbook NYC,” Human Services: Active Expense Contracts, FY 2017. These contracts cover several years, which is why these spending figures don’t align with other figures in this report about annual spending on homeless services. Office of the New York City Comptroller, “Comments on New York City’s Preliminary Budget for Fiscal Year 2018 and Financial Plan for Fiscal Years 2017–2021,” Mar. 2, 2017, pp. 38, 57. Corinth, “Ending Homelessness,” p. 11. NYC, Office of the Mayor, “Turning the Tide on Homelessness in New York City,” Feb. 28, 2017, p. ii; “Bill de Blasio’s Homelessness Crisis,” New York Daily News, Sept. 20, 2015; “What’s Really Driving the Homeless Crisis,” New York Post, Dec. 7, 2016; Coalition for the Homeless, “Coalition for the Homeless Statement on Homeless Crisis During the Holidays,” Dec. 21, 2017; Nicole Malliotakis for Mayor Campaign, “Helping Our People Excel: A Plan to Turn the Tide of New York City’s Homeless Crisis,” June 29, 2017; “Speaker Corey Johnson’s Remarks as Prepared for Delivery: Association for a Better New York (ABNY) Power Breakfast Keynote Address,” Jan. 30, 2018. New York City may be the only jurisdiction in the nation to make separate provision for adult families. 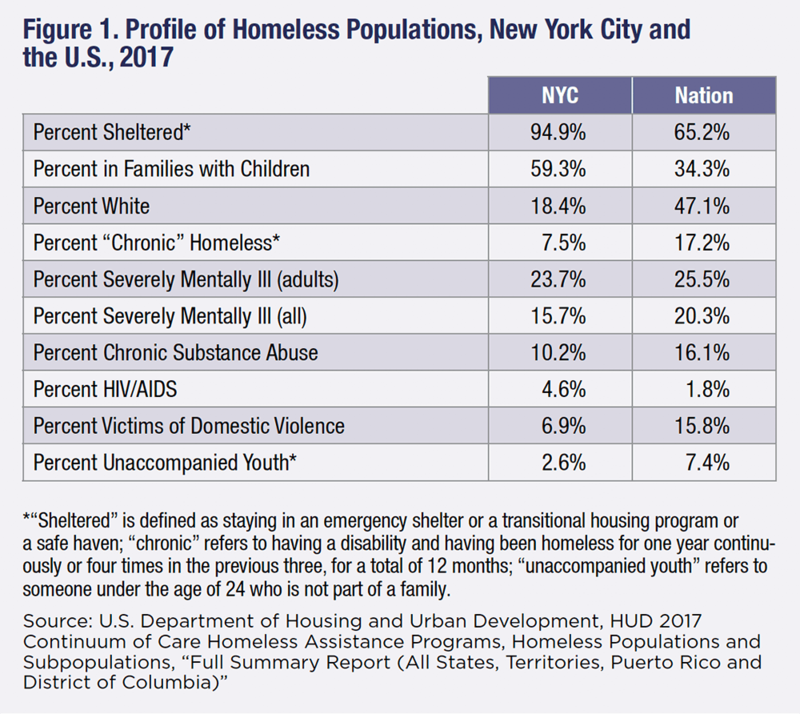 See Christin Durham and Martha Johnson, “Innovations in NYC Health & Human Services Policy: Homelessness Prevention, Intake, and Shelter for Single Adults and Families,” Urban Institute, February 2014, p. 3. NYC, Mayor’s Office of Operations, “Mayor’s Management Report Fiscal 2017,” September 2017, pp. 208–9. Greg Smith, “NYC Neighborhoods Seeing Influx of Homeless People Face Quality-of-Life Issues,” New York Daily News, Feb. 18, 2018. New York City Independent Budget Office, “Albany Shifts the Burden: As the Cost for Sheltering the Homeless Rises, Federal & City Funds Are Increasingly Tapped,” October 2015. “Testimony of Daniel Tietz,” Nov. 17, 2016; “Testimony of Daniel Tietz,” Nov. 21, 2016; New York City Council, Finance Division, “Report of the Finance Division on the Fiscal 2018 Preliminary Budget and the Fiscal 2017 Preliminary Mayor’s Management Report for the Department of Homeless Services,” Mar. 27, 2017, p. 6. Office of the New York City Comptroller, “An Investigation into the Provision of Child Care Services in New York City Homeless Shelters,” October 2016. NYC, Department of Homeless Services, “Single Adults: The Shelter System”; idem, “Families with Children: The Shelter System”; NYC Department of Social Services, “Testimony of Steven Banks, Commissioner of New York City Department of Social Services Before the New York City Council General Welfare Committee; Oversight: From Path to Permanency,” June 27, 2017, pp. 8–11. New York City Council, Committee on General Welfare, “Committee Report, Oversight: Conditions and Operations in the Department of Homeless Services’ Family Shelters,” Feb. 27, 2014, p. 8. New York City Council, Committee on General Welfare, “Briefing Paper and Report of the Governmental Affairs Division: Oversight: DHS’ Implementation of the Family Income Contribution Requirement and Client Conduct and Responsibility Procedure,” June 24, 2009; 18 NYCRR Chapter II, Regulations of the Department of Social Services, § 352.35(f). NYCRR, Chapter II, § 352.35(c)(3). New York City Council, Finance Division, “Report of the Finance Division on the Fiscal 2018,” p. 9. New York City Council, Finance Division, “Report of the Finance Division on the Fiscal 2018,” p. 9; “Testimony of Steven Banks,” June 27, 2017. “Testimony of Steven Banks,” June 27, 2017. NYS, Office of Temporary and Disability Assistance, “Administrative Directive 15-ADM-06-T, Temporary Housing Assistance: Consolidation and Clarification of Policy,” Nov. 4, 2015, Section 2.V.D. 2; NYS, Office of Temporary and Disability Assistance, “Administrative Directive 16-ADM-11, Temporary Housing Assistance: Consolidation and Clarification of Policy,” Nov. 3, 2016, Section 2.V.D. 2; New York City Council, Committee on General Welfare, “Hearing Transcript, Oversight: PATH to Permanency,” New York City Council, Committee on General Welfare, June 27, 2017, p. 155; Peter Nasaw and Thomas J. Main, “De Blasio Wrestles with Homelessness—Part Two: Setbacks and Responses,” Gotham Gazette, May 1, 2017. 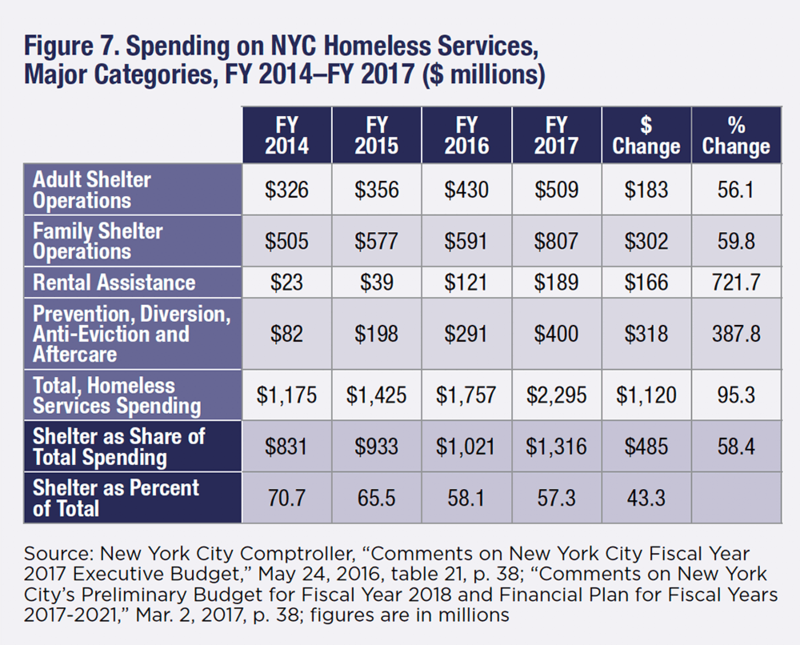 NYC, Department of Homeless Services, DHS Strategic Plan FY 2012–2014. New York City Council, Committee on General Welfare, “Testimony of Coalition for the Homeless and the Legal Aid Society on Proposed Eligibility Rules for Homeless Single Adults,” Nov. 9, 2011. Marc Santora, “City Eligibility Policy for Homeless People Seeking Shelter Was Enacted Illegally, Court Says,” New York Times, Feb. 15, 2013. NYC, Office of the Mayor, “Mayor de Blasio Announces Over 68,500 Students Enrolled in Pre-K for All,” Dec. 18, 2015; New York State Department of Health; “NY State of Health Enrollment Tops 4 Million,” Oct. 5, 2017; NYC, Office of the Mayor, “Mayor de Blasio Announces Record Pace Building and Protecting Affordable Housing,” July 13, 2017. Prevention programs include Homebase, legal services for tenants fighting eviction proceedings, and “one shot” emergency rental-assistance grants. Examples of rental subsidies include the Living in Communities (LINC), City Family Eviction Prevention Supplement/Family Exit Plan Supplement (CityFEPS), the Special Exit and Prevention Supplement (SEPS) voucher programs, and the reinstatement of NYCHA and Section 8 preferences for shelter clients. See “Turning the Tide,” chs. 2–3. Mariana Alexander, “A $3 Billion Problem: Homeless Services in New York City,” cbcny.org, May 24, 2018. “Turning the Tide,” p. 19; “Testimony of Steven Banks,” June 27, 2017. “Turning the Tide,” pp. iii, 3, 86. Graham Rayman et al., “Deranged Man Fatally Stabs Girlfriend and Her 2-Year-Old and Infant Daughters at Staten Island Motel, Another Toddler Clinging to Life as Police Hunt Maniac,” New York Daily News, Feb. 10, 2016; Ginger Adams Otis et al., “Cops Looking for Killer of 55-Year-Old Homeless Man Whose Throat Was Slit in Manhattan Shelter,” New York Daily News, Apr. 16, 2016; Office of the New York City Comptroller, “Audit Report on the Controls of the Department of Homeless Services over the Shelter Placement and the Provision of Services to Families with Children,” Dec. 18, 2015; NYC, Department of Investigation, “DOI Investigation of 25 City-Run Homeless Shelters for Families Finds Serious Deficiencies,” Mar. 12, 2015; New York Senate Independent Democratic Conference, “Horrors in Homeless Housing,” Jan. 2017; New York State Comptroller, “Oversight of Homeless Shelters,” Report 2015-S-23, Feb. 12, 2016; idem, “Oversight of Homeless Shelters (Follow-Up),” Report 2016-F-31, June 27, 2017. New York City Council, Committee Report “From PATH to Permanency,” pp. 9–10; idem, “Brieifng [sic] Paper of the Human Services Divisions”; New York City Council, Finance Division, “Report of the Finance Division on the Fiscal 2018”; “Testimony of Steven Banks,” June 27, 2017. “Mayor’s Management Report Fiscal 2017,” Sept. 2017, p. 209. Greg Smith, “Violent Assault Quietly Redefined at City Homeless Shelters Keeping ‘Critical Incident’ Statistics Down,” New York Daily News, Feb. 17, 2017; Stephen Eide and Max Eden, “Doctoring the Safety Stats,” City Journal, May 25, 2018. “Turning the Tide,” p. iii; New York City Council, “Brieifng [sic] Paper of the Human Services Divisions,” Apr. 21, 2017, pp. 12–13. Yoav Gonen and Ruth Brown, “Homeless Hotels Are Costing Taxpayers a Fortune,” New York Post, Jan. 31, 2018. “Turning the Tide,” p. iii and ch. 5. “Mayor’s Management Report Fiscal 2017,” September 2017, p. 207. See NYC, “Fiscal 1997 Mayor’s Management Report, Summary Volume,” September 1997, p. 42; “Fiscal 1998 Mayor’s Management Report, Summary Volume,” September 1998, pp. 81, 133, 137; “Fiscal 1999 Mayor’s Management Report, Summary Volume,” September 1999, p. 119; “Fiscal 2000 Mayor’s Management Report, Summary Volume,” September 2000, pp. 87, 93; “Reengineering Municipal Services 1994–2001: The City of New York Mayor’s Management Report Fiscal 2001 Supplement,” pp. 119–23. Ibid. ; Durham and Johnson, “Innovations in NYC Health & Human Services Policy”; NYC, Office of the Mayor, “Uniting for Solutions Beyond Shelter: The Action Plan for New York City,” June 2004, pp. 25–28; NYC, Department of Homeless Services, “A Progress Report on Uniting for Solutions Beyond Shelter: The Action Plan for New York City,” Fall 2008, p. 13. “Mayor’s Management Report Fiscal 2007,” September 2007, p. 39; “Mayor’s Management Report Fiscal 2008,” September 2008, p. 38; “Mayor’s Management Report Fiscal 2009,” September 2009, p. 37. NYC, “Mayor’s Management Report Fiscal 2013, September 2013,” p. 111; New York City Council, FY 2015 Department of Homeless Services Preliminary Budget Hearings, “Testimony of Christy Parque, Executive Director, Homeless Services United, Inc.,” Mar. 24, 2014; Durham and Johnson, Innovations in NYC Health & Human Services Policy; New York City Council Committee on General Welfare, “Committee Report: Hearing on the Fiscal 2015 Preliminary Budget & the Fiscal 2014 Preliminary Mayor’s Management Report,” Mar, 24, 2014, p. 14. NYC, Department of Homeless Services, “Review of Homeless Service Agencies and Programs,” Apr. 11, 2016, p. 14; “Testimony of Steven Banks, Commissioner, New York City Department of Social Services Before the New York City Council General Welfare Committee, Oversight: Post-90 Day Review,” Apr. 20, 2017, p. 11; “Testimony of Steven Banks”, June 27, 2017, p. 5. The Bushwick Economic Development Corp., Housing Bridge, and We Always Care are shelter providers that lost their contracts under de Blasio. See New York City Council, Committee on General Welfare, “Hearing Transcript, Oversight: Post-90 Day Review,” Apr. 20, 2017, p. 60, and idem, “Hearing Transcript, Oversight: PATH to Permanency,” June 27, 2017, p. 78. Main, Homelessness in New York City, pp. 193–94. “Testimony of Steven Banks,” June 27, 2017, p. 149. U.S. Department of Housing and Urban Development, HUD 2017 Continuum of Care Homeless Assistance Programs, Homeless Populations and Subpopulations, “NY-600 New York City CoC, Point-in Time Date: 2/7/2017”; “Final Rule: Homeless Emergency Assistance and Rapid Transition to Housing: Defining ‘Chronically Homeless’,” Federal Register Vol. 80, no. 233, Dec. 4, 2015, p. 75792. “Mayor’s Management Report Fiscal 2017,” p. 210.